A blog to share pictures of my gaming and painting. As well as being into gaming I'm also a member of a figure club here in Atlanta (Atlanta Military Figure Society - http://www.atlantafigures.org/ . This is a great group of people, men & women, who share their painting skills and historical knowledge on how to paint a wide range of historical figures using different painting methods. 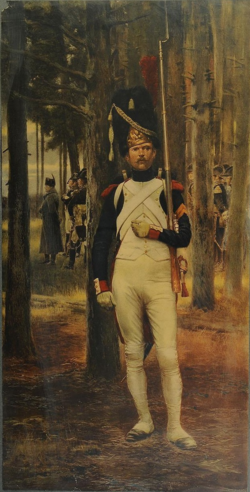 The figure you'll see below is of a French Grenadier of the Guard by Stadden. You'll see the differences in white on this painting and that's what I'll be trying to recreate with oils. I start off with acrylic paint as a base but will then put the oils on top of that. I'll keep everyone updated on my progress. I have been working on a new project. Something that I've always wanted to do and in previous posts I showed some other pictures of my 1806 project. These photos are of a newer figure line that is starting out with 1806 Prussians. The company is called "FG MiniZ Forgotten & Glorious Company of Art" (http://forgottenglorious.blogspot.fr/). They are a French company and I think the miniatures they've produced are good and worth an investment from those of you who want to build 1806 Prussian units especially since the Euro to Dollar is at a good rate. One word of advice when you get the figures home is to brush the musket barrels with a superglue to strengthen them. I find them too weak and easy to break off but brushing them with superglue prior to priming and painting helps. As always, thanks for looking. Comments welcome. I am selling the last of my painted WSS stash. You can find it on TMP (http://theminiaturespage.com/market/msg.mv?id=71062). Contact me if you are interested in any of the remaining units. I also have a fair amount of unpainted Front Rank WSS figures and if you are interested in those just let me know. Thanks. Hello All, Sorry for the long delay. From being unemployed to now employed for the last 7 months I seem to have lost the time to paint. What I'll be posting over the next few weeks are photos of my painted and unpainted collection. No, I'm not totally getting out of the hobby but I am going to cut back considerably on what I currently have. I just don't have the time or inclination to paint the large units and forces necessary for the gaming that I prefer. Plus, our group's attendance has dropped off so much that we're lucky to have 4 people (including myself) to game anything. So with a heavy heart I'm facing reality and going to focus on those things that we can do. Stay tuned for the different figure lots that I'll be making available for sale. If you are interested in any of the remaining WSS units in my collection please contact me for an updated list. Some of the units listed below have been sold. Thank you. Please contact me at 18th_century_guy@comcast.net or leave a comment here. I am selling off my WSS collection of mainly Front Rank WSS figures. I have 19 French infantry at 24 figures each and 23 French cavalry at 12 figures each. I also have a Danish foot, British foot and horse, Dutch foot, and Bavarian foot and horse, all at the same mounting level. I also have 2 C-in-C bases plus 6 Brigadiers in blue coats. I'm not supplying photos of every unit, that would be too much but I am showing you a few of each and if you want to see a specific unit then I can supply that to you. Most all of the horse was done using oils so the colors are quite rich & deep. Almost all of my units have oversized cloth flags from The Flag Dude and they look amazing. A couple units have GMB flags and a couple have paper I did up from Warflags. Most all figures will cost $8USD apiece and a cavalry figure is made up of 2, the rider and the horse (the Garde costs more). I'm also charging for the flags as they cost $12USD apiece. So a typical foot unit with 4 cloth flags will cost $240.USD. I cannot offer 'volume discounts' as I did not paint these in volume. Shipping costs, if any, will depend on the number of units purchased. Below is a listing of the regiments. A (c) means cloth flag from The Flag Dude, (GMB) means from GMB, and (p) means paper from WarFlag.